Summer, and fire season, is over, at least in these parts. There was a large fire (nearly 100,000 acres) not far from our place. We got quite a bit of smoke and ash and just recently were advised that we were a few hours away from being told to evacuate. Fortunately the (Chippy Creek) fire was contained at a critical point and we were spared that situation. Our hearts do go out to those in Southern California and other areas who were not so fortunate. But it's turning cooler, horses are getting fuzzy, hay is in, and the water tank heaters are in place. And the holiday season is nearly upon us! In this edition of Nose to the Ground I'll focus on just a few gift ideas, maybe something to help give your holiday shopping a kick start. 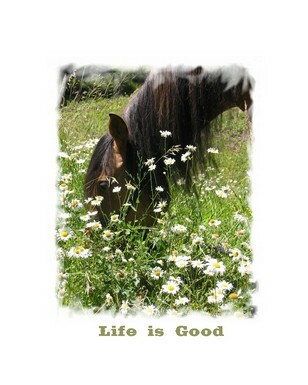 FROM THE GIFT SHOP - "LIFE IS GOOD"
A favorite photo I took on a nice day a couple of summers ago shows my mare, Ivy grazing contentedly in a patch of wildflowers. I've added a caption and now feature the photo on several items in the Gift Shop - the "Life is Good" product line was born! - a Coffee mug (to give you a little pick-me-up with that morning cup of coffee on a cold or rainy day) a Journal, Tote Bag and refrigerator Magnets all feature the Life is Good photo. You can still get the Journal and Tote Bag with the Ranch Logo together with a Journal featuring Lars the Norwegian Fjord. The Wall Clock has been removed from our Gift Shop inventory. While attractive and reasonably priced, the quality is not what I expected and I do not want you to be unhappy with any of our products. I've been looking through the BITS Holiday Catalog which just arrived in the mail. As always there's a broad range of high quality items. They also have a 50% Off Clearance Sale in progress. Might be worth your while to pay a visit to the Back In The Saddle On Line Catalog . To keep things simple in your search for a good book for the Christmas stocking I've picked three from our four foot book shelf. They are - Dancing With Horses by Klaus Ferdinand Hempfling - excellent for anyone who has the desire to work with horses, The New Encyclopedia of the Horse - our long time favorite horse book, excellent for the person new to horses), and The Art of The Horse - a wonderful gift for the horse/art lover. You can find these (and more) on our Horse Books page. It would be a mistake to suggest a specific saddle as candidates for holiday gifts. After all, you'll want a saddle to fit a specific need. So I'll simply suggest three top brands and let you take it from there. If you pick a saddle produced by Circle Y, Crates or Reinsman you won't go wrong. I use a Crates saddle myself and am familiar with several of the Circle Y models. They have some truly beautiful show saddles if that's what you're after. It's just recently that I had the opportunity to look over some Reinsman saddles up close and I was very impresssed. Reinsman has a super reputation to begin with but I feel much more comfortable recommending the brand after having had the opportunity to "touch and feel". A new saddle and tack shop in our neighbor hood features these brands. I hadn't seen a Dale Chavez saddle up close before though I know of their reputation. There was a Chavez Show Saddle on display and I really wanted to take it home (but didn't). Here's one for you, if you're looking for that"Ultimate" holiday gift. It costs a bit more ( a lot more) than most saddles but it is indeed something special. If your wallet is a little heavy and you feel the need to lighten it some just read on! I came across this almost by accident but think it's worth sharing. "Courage is being scared to death and saddling up anyway"
You've no doubt seen many advertisements or received flyers in your mail regarding commemorative edition of this or that - everything from coins to plates to thimbles to whatever someone can think up. These items range from the useless and tacky to the downright beautiful. For the most part they don't appreciate in value over time despite occasional claims that they are a "wonderful investment". More often than not these are pitched as "limited editions"and you'd better order before the supply runs out as they will never be offered again. Of course thre are exceptions to the above and is one. A limited-edition saddle has been produced commemorating John Wayne's 100th anniversary. The saddle, modeled after John Wayne's own saddle, is produced by Circle Y of Yoakum , Texas so a very high quality of workmanship and attention to detail is to be expected. It is hand tooled with engraved brass rigging andtrimmed with silver pesos. I have great admiration for John Wayne as an actor and as a person who stood for his beliefs and love of country. If your horse lover feels the same, this saddle might be the perfect Christmas gift. It is a bit pricey (more than a bit) so may well belong in the "Ultimate Gift" category. I thought I would share it with you. The Horse Saddle Shop is one of the distributors and I've found their price to be a few hundred dollars below the average price given elsewhere. There's also free shipping and The Horse Saddle Shop will help you with questions regarding proper fit for this or any other saddle type in their extensive inventory. Click here or on the illustration for more details. Here's a page on Circle Y Saddles - you'll find the John Wayne saddle at the bottom of the page. Have a Happy Thanksgiving! See you next month.